Our Weekend away dates for April 2019 have been confirmed! We will have the entire Bunkhouse to ourselves from Friday the 5th until Sunday the 7th of April! We will get the opportunity to break away from the Big Smoke for one of the first BST weekends and enjoy some riding in beautiful South Downs! Like in previous trips, this is a relaxed weekend, where all levels of riding are welcome and which we can organise depending on the participation. I will be updating this post with proposed routes and other tips and plans for the trip in due course. The price comes to £28 per person plus an additional £4 for linen each and £5 for breakfast. All charges are per day so calculate x2. Therefore total per person is £74 for the full package. Breakfast (optional) includes: 2 slices of bread, butter, ham & marmalade, porridge, a piece of fruit, fruit juice and yoghurt. This is a bag prepared by Katie who owns the bunkhouse. If you don’t fancy this combination, you can always opt out and bring your own breakfast. I have requested to include linen and we can arrange to bring our own food for breakfast etc. for those who may wish to do so or just request the full package and keep it simple. If you have any dietary requirements, do let me know. (You can add it in the comment box before completing the payment at the club shop - I’d suggest to avoid the breakfast option and bring your own). TICKETS ARE NOW AVAILABLE IN THE CLUB SHOP! Arrive at Amberley on Friday. those wishing to settle in early and go for a ride, feel free to do so. Some of us will be taking later, evening trains and possibly arriving at the Bunkhouse after 9pm. We usually pack our dinner for Friday individually but there’s always a pub option nearby. Ride on Saturday am, departing around 9. Groups to be agreed on the day to accommodate all levels. Typically we do a longer ride on Saturday, around 100km. See route examples further below. These include the odd food stop/lunch break. Saturday Return at the bunkhouse after the rides in the afternoon, shower and go to the local pub “George and Dragon” for dinner and cocktails. Their menu can be found here. Please pm me your meal preferences by the 23rd of March to preorder our food. Sunday pack our luggage and release the rooms. We can store our stuff at the bunkhouse and set off for another, possibly shorter ride. Options tbc. After the ride, return to the Bunkhouse to pick up our luggage and take the trains to London from Amberley. Should you wish to leave earlier, please let the rest of us know. Bumping this. Updated info above. Just a reminder for those who are making plans for 2019 over the relaxing Christmas break! Our Weekend trip is in early April and it'd be a lovely way to welcome the BTS season! Remember to get your tickets at the club shop! Hi ladies and happy new year. We need to pay the Bunkhouse to secure the dates. The club has already paid for half the deposit but we need to pay the other half by the end of this week. Can those of you who have expressed interest please confirm your attendance and get your tickets from the club shop if you wish to come along? Not everyone who has pressed 'I can attend' has gotten a ticket, so I am not sure about what numbers we're looking at. If there is no desire for this, we will need to cancel, as we absolutely must sell all the tickets, otherwise the club will have to subsidise for the loss and this is something that is best to be avoided, as money can be useful in other, much needed areas of our activities. If you have any questions about what's involved in the trip and need to know more, please comment below. I will try to set out all our options soon (proposed routes, food options, nearby pubs for dinner, etc.). Ok, in the spirit of Reddit's Explain Like I'm Five board, can someone give me rundown of the logistics for this? I understand the transport to the bunkhouse via train, so that's not a concern, but tell me about packing and getting your stuff there. I've never gone anywhere with my bike that wasn't a single ride out and back on the same day with only the clothes on my back and some gels etc. The idea of going away for a weekend, without a suitcase, with my bike, and bringing some nutrition all seems daunting. How does this happen? A bonus would be if any past participants had a photo of what they packed/how they did it etc. Thanks ladies...I think I might be joining you (assuming one commitment lands on the weekend prior, not this one), but I gotta get my head around this first. In one of the previous trips last year (September 2017) when I joined, I had a backpack with one set of clothes, pjs, two sets of kit. Breakfast was included so it saved the faff of having to go shopping. I think there was a car available but we didn't need to use it. We all brought a taper with snacks (I had made some vegan energy balls) so we all had plenty of snacking available. Friday we had our own dinner with us (like Judie mentioned, takeaways we carried on the train) and Saturday evening we booked at a local pub 5' walk from the station, which was an outdoor pation and we chilled over there having drinks etc. (amazing green views btw!). Lunch was not an issue, as that was part of our rides, where the break was at a pub (those are included in some of the routes I've shared above) so lunch wasn't an issue. We can coordinate rides to start at reasonable times so we can get our mid-ride break around lunchtime. Myself, went to Amberley by train, like most of us, which is a 10' ride from the bunkhouse, so if you've packed everything you need in a rucksack/big backpack, you should be fine carrying everything. If you're in cycling kit on the way there, you save space to store helmets, shoes and the one kit, so it's pretty light packing. When I went, I went there late Friday (after work) also due to the fact that bikes are NOT allowed on trains during rush hour, so it'd need to be either Friday morning or Friday evening that we can get bikes on the train. I would like to join, but I am not sure if I'd be a fast enough or strong enough cyclist. I can go long distances (I have done 100K rides) and I frequently ride with CTC London, but I do their 2 star rides, which are about 17-22km/h and while they do have hills, they don't have exceptionally long or super steep ones. Also on those rides everyone is happy waiting for the slowest to catch up. I have never ridden with Islingon CC before as most of your events that I have heard about have been races, and I feel that you are a faster more athletic club than my level. In this trip what speed/difficulty level will the rides be at? Hi Pandora, all levels are welcome - sign up! Yes @Pandora, we will make sure there’s always a more socially paced group to make in all-inclusive. We would like to have the experience of a 60-100km ride though, merely for the reason that someone won’t need to be carried back to the bunkhouse! :P But as it seems you don’t have that “issue” so feel free to tag along! @Alex_vF it’s on a “first come, first served” basis, so once tickets sell out, you will see that there’s no availability at the club shop where tickets are sold. Ah no, not a chance of cancelling! :) The club has taken care of that option to help us do it. We simply don’t want to make a loss out of this. :) it would be a shame. I have booked my ticket! I have also bought my train tickets to Amberley and back. I made a mistake though (because it's late and I'm tired) and I booked two outbound tickets from London Victoria to Amberley on 13.36 train. Before I try seeing if I can return the duplicate ticket, would anyone like to buy it off me? It's a super cheap one way £5 ticket so you will still need to book your return. All, please check if you can take your bikes on the trains during peak times. Bikes on the train are not allowed between 4-7pm departing London with Southern. Always check with your train company for bike restrictions, as they tend to vary. I am more likely to arrive after 9, as I’ll need to be at work until 6pm & can’t take the afternoon off. We’ll coordinate closer to the day about keys, settling in, etc. I did the last trip and we were a mix of paces in different groups, definitely not all super-fast so don't be put off @Pandora! I also have some routes we planned last trip which I can share, we had a short, medium and long route for the Saturday. I'll be getting a train from London Bridge shortly after 7pm. For people arriving later in the day, make sure you have a decent front light as its quite dark in Amberley and you'll need one to see on the road from the station up to the bunkhouse. I’m definitely going to be a late-comer so whoever goes there first, please let me know so we can coordinate and get everyone in the house before my arrival. I’m planning to start a Whatsapp chat closer to the date for logistics so please DM your phone numbers to add you. I’ll create this two weeks before the trip. Cheers! I contacted the the local pub to reserve space for is on Saturday the 6th. Attaching their response. We need to confirm numbers by the 23rd. Can those of you who are coming have a look at their menu and let me know what’s your preference along with any special requirements (allergies, vegan, etc) to collate it all by then? Thanks! I Will update on this, apologies! 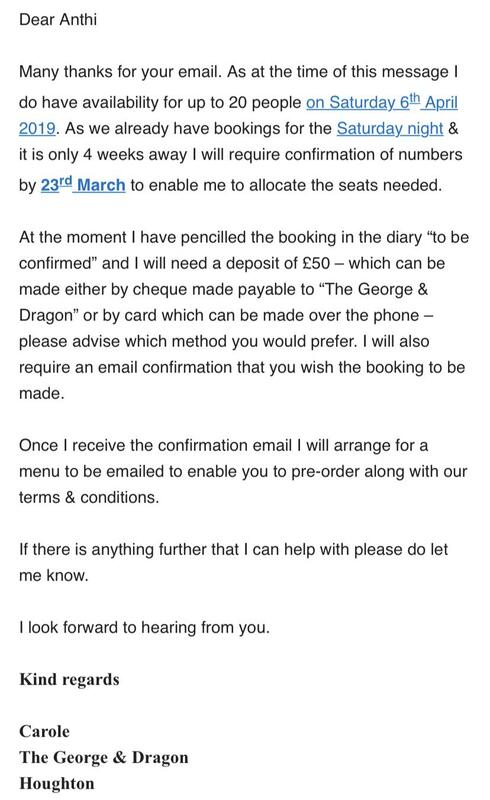 In case other VCs would like to join,please can you let them know that we need confirmation by the 23rd of March, so I can coordinate the booking with the local pub where we will have dinner/drinks on the 6th? Cheers and have a great time in Belgium 🇧🇪! This trip sounds lovely! I will buy my ticket later today.